An “armed and dangerous” man is on the run in Bosnia after killing two people. Police are looking for Eden Gacic who is suspected of killing a grocery shop owner new Konjic, a week ago, and shooting a policeman on Saturday in Suhodol. Gacic, 42, has previously served two prison terms for murder and was released in 2017, after serving two-thirds of his 20 year sentence. He was convicted then of killing his mother, and a man who served with a battalion of Muslim volunteers during the 1992-95 war in Bosnia. According to Bosnian media, Gacic served in the same unit as the man he killed, which fought alongside Bosnian army soldiers under the country’s wartime Muslim-led government. Aljosa Campara, the country’s interior minister, said: “We are checking any information we get. All police agencies have been engaged. Police said 1,200 officers have been deployed in the manhunt and they are prepared to ask the army to step in if necessary. Heavy snow has made the search in mountainous regions more difficult. Bosnians have expressed fears about the gunman on the loose. Samsung has reportedly postponed two launch events for its Galaxy Fold smartphone after some reviewers claimed it broke after just two days. The first foldable device from a major manufacturer, it is similar in size to a normal phone when closed but opens out to form a tablet-sized screen. Journalists posted scathing reviews last week, saying their handsets had become “unusable” 48 hours after receiving them. The events were scheduled in Hong Kong and Shanghai this week, but the company is now said to have pushed those dates back. Whether the postponement is due to negative press caused by potentially faulty review copies is unclear. The South Korean company has called the Fold “unlike any device that has come before it”. It also features six cameras and will cost about £1,500. The company claimed it could be opened and closed 200,000 times – or 100 times a day for five years. Reviewers said removing the plastic film from the interior screen made the phone unusable – although keeping it on did not seem to prevent other devices from breaking. Bloomberg’s Mark Gurman tweeted that the “screen on my Galaxy Fold review unit is completely broken and unusable just two days in”. The Verge’s Dieter Bohn, and CNBC’s Steve Kovach also had issues with the screen. It is not the first time Samsung has experienced a difficult product launch. Its Galaxy Note 7 device was recalled because the batteries were spontaneously combusting prompting a widespread ban on the devices by airlines. It comes after former president Omar al Bashir was ousted, with the military council taking over. Sky’s chief correspondent Stuart Ramsay reports from Sudan’s capital. Political insiders and people generally in the know here, have been warning me for days that the youth-led revolution in Sudan is far from done; it seems they were on the money. 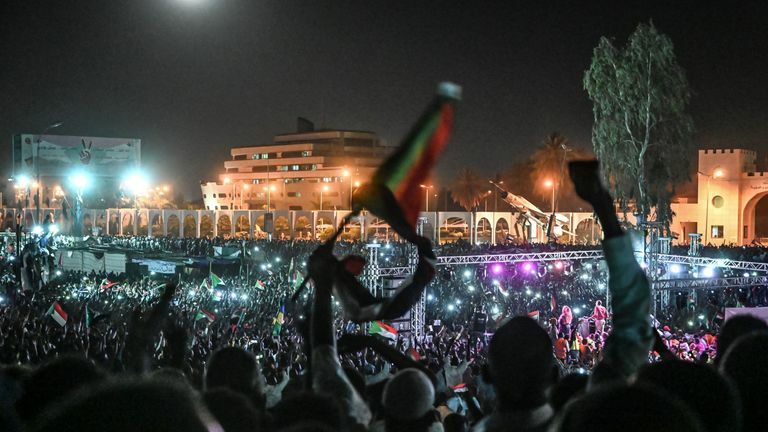 You would never have known there were any doubts though, as tens of thousands gathered in the main protest square in Khartoum for a night they expected to celebrate long and hard. They believed they were gathering to hear the names of the people who would make up the main part of a new civilian-led leadership council for the country. As we pushed our way through the crowds towards a newly erected stage at one end of the square I was constantly hugged, clapped on the back and made to dance as pop music boomed through speakers. The clear night skies, bringing a pleasant drop in the temperature, seemed to indicate that this really was to be a night of celebration… But there were already signs that things weren’t right. Everyone welcomed me to the “New Sudan” as I passed. I asked if this was it. “Yes this is it,” they would shout above the music through beaming smiles of joy. The clear night skies, bringing a pleasant drop in the temperature, seemed to indicate that this really was to be a night of celebration. They are used to turning out in huge numbers but there was a special feeling in the air. They filled the streets, clung to billboards and sign posts and hung off bridges. It was closer to a rock concert than a political rally. Mobile phone lights twinkled in the darkness everywhere you looked as people sang and danced. But there were already signs that things weren’t right. Long delays and huddled conversations between staff on the stage seemed to unsettle the crowd. Attempts were made to urge the crowd to join in revolutionary chants. Then speeches began urging the people to remember that the revolution was not over and that they needed to remain on the streets. I asked a young man if it was a good night. I asked him why and in essence he said what others had been saying: the military and the old guard don’t want to hand over control. From the stage the news finally came through that the protest leaders and the military council were having “problems” and that negotiations had now ceased. The protesters say that old pro-government political parties had intervened with their own nominations for the new council. The protest leaders said that despite their earlier agreement that the military need to be represented on that leadership council, they had decided they should have no representation. They also said that they were to announce the new leadership themselves and no longer recognised the military leaders. I’ve heard this gambit before – most recently in Venezuela. It basically doesn’t work unless a substantial section of the military are on your side. There is nothing to indicate at this stage if that is actually the case here. But some major military figures have yet to show their hand – one way or the other. Dr Mudawi Ibrahim Adam, a human rights specialist who has been imprisoned by the now overthrown Omar al Bashir a number of times, is widely tipped as a future prime minister, if agreement with the army can be reached. He told me in the garden of his house that the current negotiations were in a dangerous phase. He said political parties and indeed the military were all suspicious of each other and that there needed to be a new “strong prime minister”. He said that if there was a power vacuum there could be instability. “Anything can happen, it could empower the military council more, because the military council – the transitional military council – will start using executive powers,” he said. “It will be very hard, very difficult for them, to leave these powers (for the civilian council),” he stressed. How this breakdown in trust between the protesters and the military council will develop isn’t clear yet. But it isn’t good. More and bigger protests are being planned. These are dangerous days. The celebrations are on hold.